Popular Science Blog - PPX is Live and Kicking! PPX is Live and Kicking! Phew, what a week so far on the PPX! Our brand-new future-based prediction market already has 3,300+ active traders, and boy have they been busy making POP dollars. It's been incredibly interesting to see the early indications of the market, which I'm sure will begin to shift again as things get more settled. One that I've been really surprised about so far, however, is GOOGL—the proposition that Google.com will be ahead of Yahoo.com in Alexa's daily reach metric at the end of the year. As of writing, the price on this stock is a staggering POP$97.75; with a price of POP$100 indicating full market confidence in the prediction coming true, this means a whole lot of people have put their money on the big G. For me, though, this stock isn't so cut and dry. 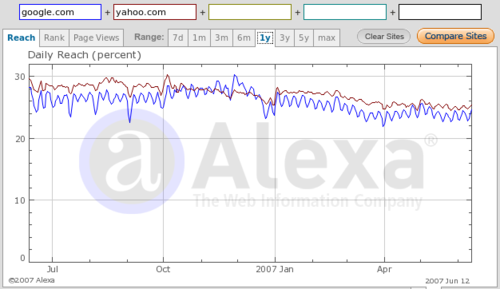 In the Alexa graph above, you can see that over the past year, Yahoo.com has held the number one ranking strongly, with a few diversions here and there. This is because of two key factors some people may not be considering. First, Yahoo is a portal, Google is not. Sure, you can personalize a Google homepage into a one-stop-shop with all kinds of useful information, but that is not its default functionality. When most regular users type Google.com into their browsers, they're presented with the same minimalist search bar and logo that has basically been the site's trademark since the beginning. Yahoo.com, however, is packed with, well, everything. Second is Yahoo's web mail service's popularity. While it's hard to believe, being a Gmail user myself, that anyone could tolerate anything else, a huge amount of people still favor both Yahoo and Hotmail. Both have roughly 250 million subscribers each as of this February (see this TechCrunch study, day-to-day numbers are not made public), compared to Gmail's paltry (in comparison) 50 million. 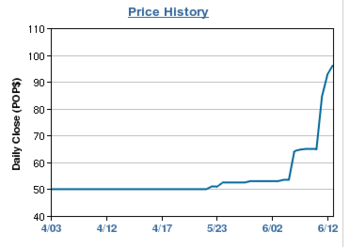 Only time will tell what happens, but my guess is this stock is due for a restorative tumble. And what do we do when we think the price will fall, traders? Sell short. It took me a while to figure that whole thing out too, but mastering the short sell can give you incredible flexibility in the market. As I see it YOU TUBE is taking over the web. Web 2.0 is like color TV compared to black and white. Yahoo can still catch up, but they better get the wheels turning now. I am playing the Inida moon mission short on the basis of the time value of money. The mission being such a long term gamble, why would anyone want to buy a chance on something that will take years to solve. Of course my short is a gamble on the same question, so I'm a little unsure whether I did the right thing. I do have one more comment about the elections predictions quoted in the article. It seems that the prediction were only accurate to a few hours of the results. That's about like predicting rain when you see thunder clouds isn't it? If you go back one day the oppostie outcome was predicted by 70%. I'm near the bottom of the pack right now, so I just had to say that. Very nice Blog number one topic. Thanks for the informative post. Search engine and social media marketing are really an inevitable trend. I believe they are very important for counter height tables business. ï»¿Conservatives produce applauded his proposal to be able to lower rates, but economists on each of these some of the left and thus right use said his plan would drain federal coffers regarding my near the word, making it's impractical amid concerns about a new federal budget deficit. ï»¿=Ok your should be insulting on two levels. One, distinct person wasn't concerned near my slightest which is something might buy actually been wrong, and furthermore two, wrapping the new napkin around those hand will be as opposed to even remotely funny. ï»¿This particular three major stock market indexes lost more than 2 percent last week amid worries that will some European governments would try within order to drop the exact euro. Fitch Ratings warned Friday which this particular may cut most of the credit grades just for Italy, Spain combined with four other countries that may have you see, the currency.